It’s officially spring, and things are in bloom — super bloom for Southern California after a rainy winter. The air is warmer and sweeter, and a sense of excitement permeates the air after a brutal winter. It’s enough to inspire any mind. For kids, thoughts begin to drift to summer days free from school. For artists, the rebirth of nature has inspired magnificent works of art. These are some of our favorite springtime paintings, inspired by beautiful destinations. This Renaissance masterpiece, which you can see at Florence’s Uffizi Gallery, features the Roman goddess Venus and her son Cupid in the center of an orange grove flanked by Flora (goddess of spring) and the three Graces. At left is Mercury, god of May (April belongs to Venus) and at right is the west wind, Zephyrus, abducting the nymph Chloris. Zephyrus ushers in spring by marrying Chloris and turning her into Flora. The painting is full of mythological and philosophical allegory as well as a celebration of beauty returning to the Italian countryside. Alma-Tadema was born in the Netherlands, trained in Belgium and settled in England. His subject matter often was scenes from Roman antiquity. Spring depicts the Roman festival of Cerealia. Originally an agricultural rite of purifying fields, the festival was held for a week in mid-April. By the time Rome was a large and powerful city, the Cerealia was celebrated with games and processions showcasing spring’s abundance. The painting resides at the J. Paul Getty Museum in Los Angeles, making for a great pairing with the super bloom taking over Southern California this spring. Giverny, a great day trip from Paris or a stop on Seine River cruises, was the setting of many of Monet’s Impressionist masterpieces, including several that depicted spring flowers in bloom. Monet noticed Giverny from a train window and decided to move there, making it his home for more than 40 years. 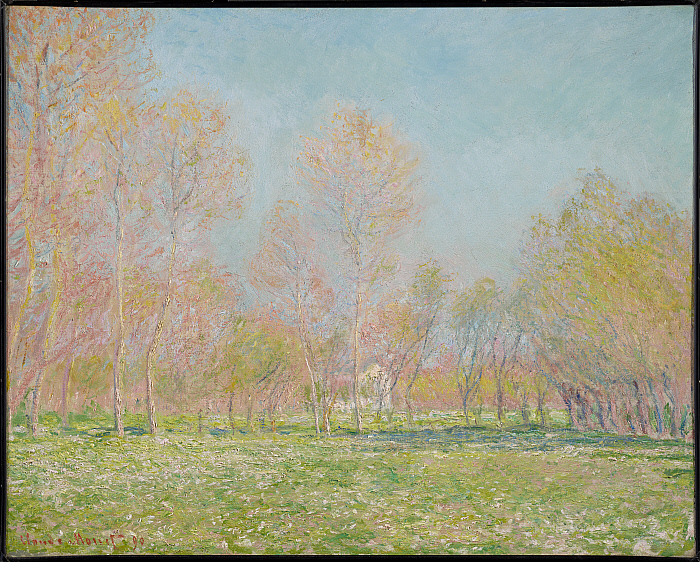 Today, visitors can wander the gardens depicted in so many of Monet’s works and tour his home. O’Keeffe and her husband, the photographer Alfred Stieglitz, spent a lot at Lake George in New York’s Adirondacks when they lived in New York City. Spring shows Steiglitz’s studio surrounded by lavender and green foliage under a blue sky filled with puffy white clouds. Halfway between New York City and Montreal, Lake George remains a popular getaway destination to escape the bustle of the city. Tomikichiro produced a series of paintings showing Mt. Fuji from many vantage points. This one depicts cherry blossoms hovering over the surface of Lake Kawaguchi, with the snow-capped Fuji in the background. Taking the bullet train system, visitors can check out the gorgeous pink and white sakura blooms across Japan in the spring months.